“Necromunda is a skirmish tabletop war game that was produced by Specialist Games (a division of Games Workshop). In Necromunda, players control rival gangs battling each other in the Underhive, a place of anarchy and violence in the depths below the Hive City. As in its parent game Warhammer 40,000, play uses 28 mm miniatures (approximately 1:65) and terrain (in this case, the Underhive – a heavily polluted, underground industrial environment). 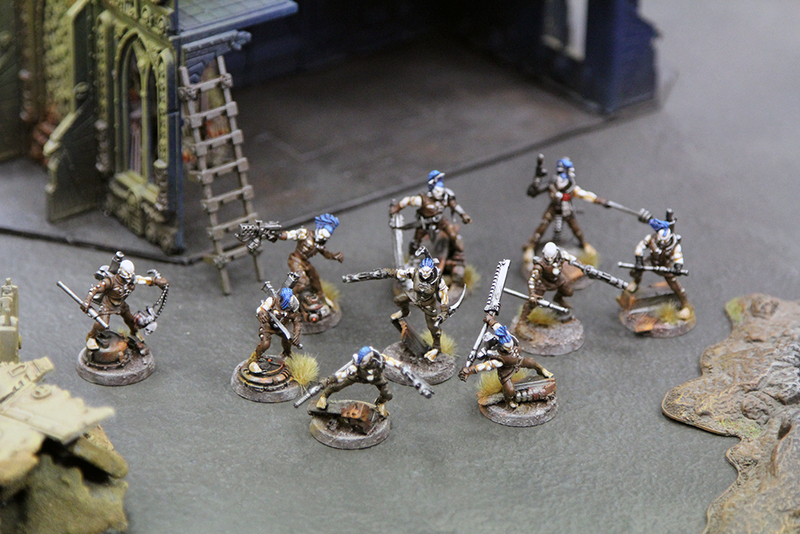 Being a skirmish game, gangs are usually limited to around nine models, but as a result game play can become more detailed. Unlike Warhammer 40,000, Necromunda also allows players to develop their gangs between battles, gaining experience, gaining and losing new members or equipment, according to a set of rules. Gangs which frequently win games acquire more credits (money) and fewer injuries and so are able to grow throughout a campaign. Rules-wise, the game draws heavily from the second edition of Warhammer 40,000, and the ruleset is commonly considered to be better-suited for the type of skirmish games Necromunda encourages. For now some impressions of my gang. It is intended to grow them up to 19 members in total and perhaps converting some Goblins into Juve proxies. Having bought into Deadzone, with loads of new terrain, it is likely that Necromunda gets slightly more attention in close future. Underneath some impressions frome games we had.